Tim has 30 years of experience in single and multi-family residential, commercial, and institutional design. Tim believes that all Architecture should be firmly rooted to its site and environment, thus his approach to design is contextual yet contemporary. Tim believes that architectural excellence is achieved with innovative design, thoughtful and elegant detailing, and discriminating selection of materials and color. His approach focuses on creating appropriate, sustainable solutions that manifest an underlying integrity of architectural concept and design excellence. As the Managing Design Partner with the firm, Tim is responsible for project design and development. In recent years, his responsibilities have also included managing the firm's overseas projects in China. Prior to co-founding Vandeventer + Carlander Architects, Tim worked as a project architect at Edward Weinstein Associates where he was responsible for the design and documentation of numerous residential commissions. Previous to Edward Weinstein Associates, Tim interned at Olson Walker Architects and Canatsey Weinstein Architects. Born and raised in Seattle, Tim graduated from the University of Washington with a Bachelor of Arts in Architecture degree. He received his Master of Architecture degree from the University of Pennsylvania where he was awarded the Dale Traveling Scholarship. 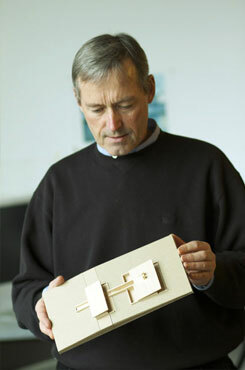 Tim is a regular guest lecturer at the University of Washington School of Architecture.